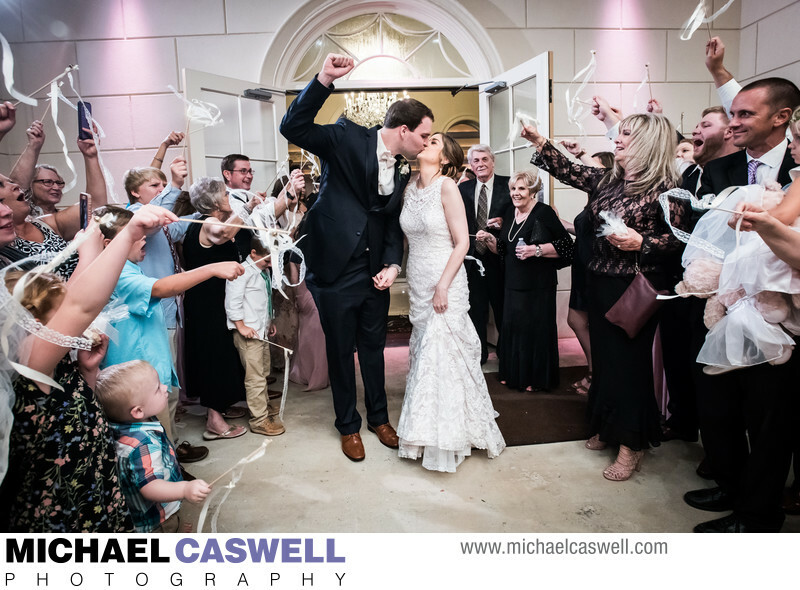 This Slidell couple's fabulous wedding day began with getting ready shots at The Greystone in Mandeville, with Christine Marie's Salon doing the girls' hair, and Melissa Vaccaro taking care of the makeup. The bride had an emotional first look with her father, and then we headed outside for the bride and groom to have their first look. There had been some rain in the area, but it cleared up just in time for us to be able to do this out on The Greystone's spacious patio and garden area. With gracefull brick-paved walkways and lots of space, this was an ideal location for the couple's first look, and we also did most of our formal group photographs here as well. Then it was on to St. Genevieve church in Slidell on the bank of Bayou Liberty for the wedding ceremony, officiated by Deacon Don Haggerty, and then we headed back to Mandeville for the reception at The Greystone, where Chad from Omega Sound & Entertainment was on hand for the DJ and MC duties, who did a fabulous job as always. Petals & Stems did the gorgeous flower arrangements and bouquets, and Tonya Mohler crafted the cakes, including Brandon's awesome LSU basketball-themed groom's cake.At the end of the festive night, the guests gave the couple a wonderful send-off with streamer sticks! Location: 935 Clausel St, Mandeville, LA 70448.